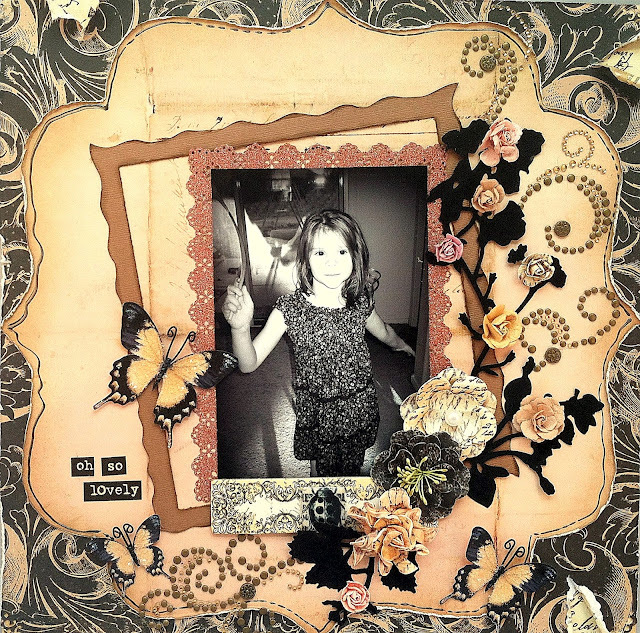 I started out by tracing an old piece of Making Memories die cut paper from the Noteworthy line on the pink paper, and cut it out, distressed it, then "doodled" an outline using the Liquid Pearls that came in the kit. I added that to the large layers and went from there. The brown frame is cardstock that I hand cut using a wavy motion, the distressed and inked it. I used the Martha Stewart Eyelet Lace punch around the page on the American Crafts glitter paper. The black vines were cut using black velvet paper with "Shadow Flowers" Spellbinders dies. The beautiful butterflies are from Angelica's Etsy shop. So, my mom was visiting last week, and I was showing her my Vagabond and dies. She isn't a scrapper, but LOVES to see all my toys! 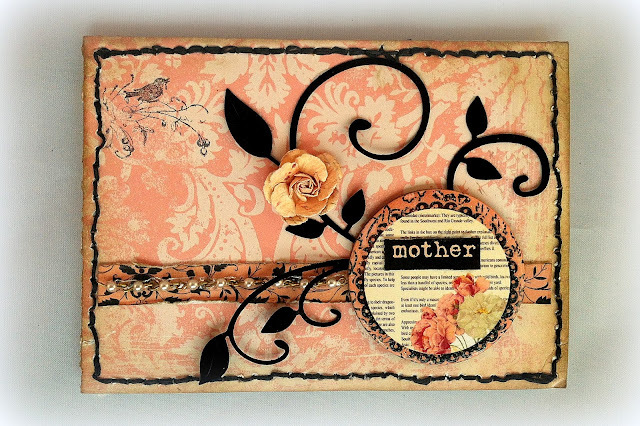 She loved the Cheery Lynne flourish die, so I decided to make her a card using it. I used mostly scraps from other projects I did with the kit, and tried to keep it a little simple. I started with the pink patterned paper- using distress ink and distressing the edges, then using "Scrapper's Floss" to sew around the edges. The bird stamp in the corner is from the Prima Pixie Glenn line. I cut the flourish die cut so it would all fit on the card. What gorgeous projects! Especially love the layout. Also wanted to thank you for the well wishes! Have a great scrappy weekend!